I don’t want to do anything when I retire. I cannot believe I am going to have to retire! He just wanted to be a grandpa. Copyright © 2010 Life’s Next Steps. All rights reserved. Suzanne and Chris Armstrong created Life’s Next Steps in response to the scarcity of information and programs dealing with the life changes facing all members of the baby boom generation. Their expertise, own personal journeys and extensive research into the hopes, dreams and needs of retiring baby boomers have been combined to create a unique, effective and inspiring retirement planning program. 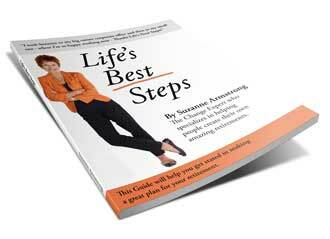 Download our Free Guide to Your Life's Best Steps and find the road to your dream retirement today! Don’t settle for an ordinary retirement! Find out why Life’s Next Steps retirement planning workshops are the best way to plan a retirement of your dreams.